We arrived back home yesterday. Thanks to everyone who hosted and fed us! As usually, it was great visiting everyone but wish we had more time. The ski trip to Mount Washington went well. Enough snow fell just before we arrived on the Monday to open most of the runs. In fact, a blizzard kept us indoors on Tuesday (although Jenny did brave it for her lesson) and a 24hr power outage kept us in the dark on Wednesday. Altogether, I managed to get in three good days of skiing without too many body aches. 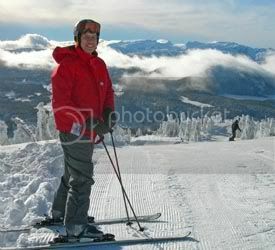 The picture is me at the top of Mount Washington on Thursday. It's absolutely beautiful up there. The kids did well. K* was very enthusiastic and managed to ski down a blue run. R* was much more cautious. Unfortunately, Jenny seems to have cracked a rib but isn't quite sure how she did it!